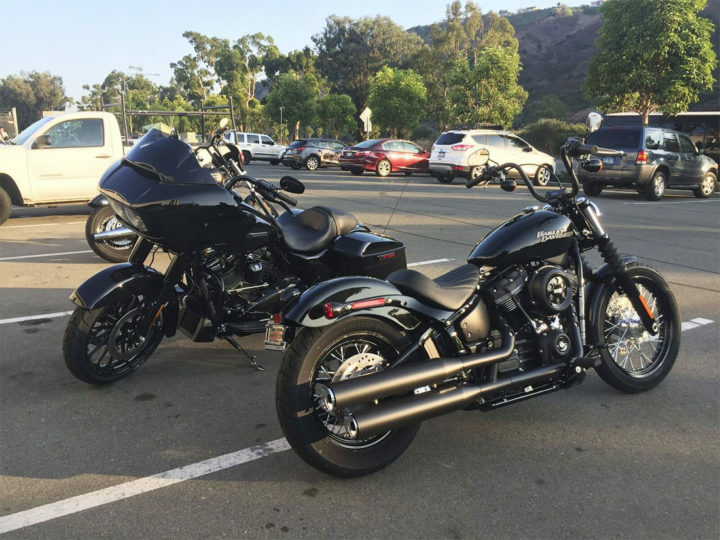 Last week, we were finally able to try out the shiny new 2018 Harley-Davidson Street Bob (or Dynatail, as it’s now commonly referred to on the interwebs) and Road Glide Special at San Diego Harley. Here are our thoughts. Katie: First impressions? I was not horrified by the looks in person. The Street Bob got a lot of negative press on its release and I was inclined to believe it based on the press photos. But in person it’s really a good looking bike. Smaller than the outgoing model — lower for sure. But still a nice looking machine. Sanna: I agree, I was pleasantly surprised by the aesthetics of the Street Bob in person, since it looked pretty ugly in the photos I’d seen. It was very small though – it looked and felt much lighter than the Dyna version, and with a smaller tank. The black mini apes were a nice touch. I’d definitely have to change out the pipes though. K: For sure — the pipes make it sound like a lawnmower. And for a chassis that aims to reduce so much road and motor vibration — those mini apes were brutal. You’re a little taller than I am — but those things put my wrists at a position I like to call “instacramp.” So — like 90% of pre-2018 Street Bob owners — I would be changing out those bars. K: Maybe they were set too far forward. Targeting the Dyna-bro posture? What did you think of it compared to your 2015 Street Bob? S: I was into it. So much power packed into such a small frame, I never expected a stock Harley to be this fast. I’m not gonna lie, I got a tiny adrenaline rush when first getting on the gas. It’s much faster off the line than my Street Bob, which is saying something since I’ve spent a lot of money on upgrades to make my bike faster. Ha! How did it compare to your Triumph? K: It was fun! It’s got that solid Harley put-you-in-your-seat torque feel, with that clunky gearbox that is both sloppy and charming. 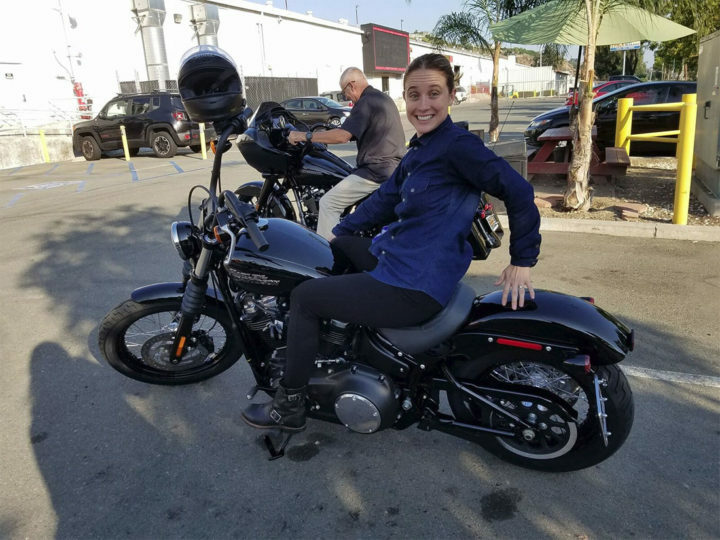 It’s weird being so low to the ground and with my arms up so high, but it was finally into that space where I was like “I could work with this…” But — as you know — my criteria for Harleys is that you have to feel cool enough to make up for any shortcomings you perceive. And with this new Dynatail — it finally got into that space. It didn’t make me feel as cool as, say, an old chopper — but it had way fewer shortcomings than any Harley I’ve ridden before. I’ve always had some beef with the “customize upon purchase” thing that Harley does, but most of my nitpicks (bars, controls for gorilla feet, not enough brakes, lawnmower sound) are things that can be modified. When my back finally gives out and I stop putting my nose over the bars in the twisties, I can see myself moving to a bike like this. The suspension was comfortable, the handling predictable, and the power at your fingertips. S: Speaking of getting older… maybe that’s a good segue into the Road Glide. S: So, I was actually more excited about the Road Glide than the Street Bob, and was fully expecting to fall in love. It’s just such a cool looking stock bike (even though, yes, as a woman in my early 30s, I realize I’m probably not the key demographic for it), you’d barely need to do anything to it. Maybe some pipes? But I think that’s a universal Harley issue. K: Pipes are more like a universal bike issue these days. I disagree with your aesthetics on this one. I just don’t see the attraction to the big-fairing-bagger thing. Sure — those purses look practical. And sure I was jealous of all the giant fairings when we went to the Grand Canyon and all those dudes were looking so comfy in the incredible highway wind. BUT REALLY. It’s huge! How are you supposed to split lanes? How are you supposed to back it up even a slight decline? It’s a beast! I was super intimidated by it. What did you think after you rode it? 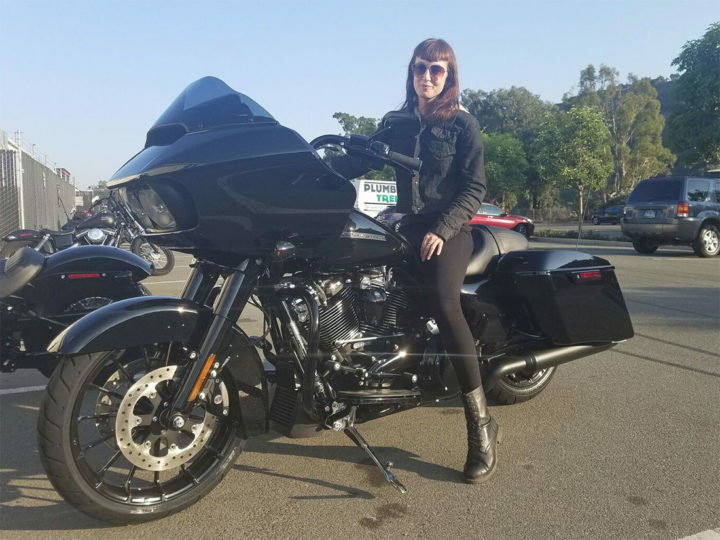 S: It’s definitely heavy and bulky, but I had the same problem when I first upgraded from a Sportster to a Dyna — it took me a while to get comfortable backing it up. The lane splitting part would be tough though — for me this would mostly be a road trip bike, not a daily commuter. (But who can afford to buy a 30K bike to use only on long trips? Not me!) That being said, I found this bike to be extremely comfortable. Riding along the coast blasting High on Fire through the giant speakers was hilarious though. I wasn’t sure whether to feel cool or embarrassed. K: Cool — you should just own the absurdity of the speakers. As for me — I’m gonna have to eat my words on this bike — because I totally get it after riding it. It’s like being in an airplane. An airplane that blasts classic rock. It handles like one of the hippos from the ballet scene in Fantasia. It’s deceptively spry. BUUUTTTTTTT. I still had some negatives. I was hot almost immediately. I hate wearing anything but a full-face helmet, but I don’t know if I could do that in the heat of summer on that bike. There is hardly any wind to your head at all so I would get swampy quick. This was my first time using a heel-toe shifter — I’m a little embarrassed to say I never really got the hang of it. My shorter legs may have been a contributing factor since it was a stretch to hit the front lever — but I don’t think I ever did find neutral. However, it took the bumps like a champ, and it has plenty of power to get that massive chassis moving. I can see why retirees who hit the road for days at a time gravitate toward this style. You could ride for days without noticing. Was there a fan in there I didn’t notice? Vents or something? There was a lot going on in that fairing and I was a little afraid of it. I can’t even work WhatsApp. S: So which one would you pick if you had to buy one and money was not an issue? Street Bob or Road Glide Special? K: As my one and only — the Street Bob. It’s sprightly enough to keep me engaged and small enough to handle my everyday riding. I wouldn’t trade out my Bonneville for it — but I can see a version of myself being happy with it as my only bike. If I’m adding to my stable? The Road Glide Special. I’d be nagging you to ride across the country immediately. You? S: It’s a tossup for me. If I had a bigger garage, probably the Road Glide. I don’t need another Street Bob, especially one that’s so fast I’d likely end up spending all my money on speeding tickets. But they were both pretty awesome. So far I’m pleasantly surprised with the 2018s. And I would ride cross country with you in a heartbeat! Sanna likes motorcycles, kittens, and punk rock. When she's not at her day job as the managing editor of Roadtrippers, she's probably riding twisties in the mountains or camping in the desert with her moto squad. She has a 2015 Dyna and a Shovelhead chopper, but she secretly dreams of owning a 70s muscle car. Katie is somewhat obsessed with dogs and motorcycles - she has 3 of each. She rides a 2017 Triumph T-120 most days, and has a 1972 Triumph T-120 and a 1975 Honda CB360 to keep her busy on the weekends. She also has a deep love for vintage vans, mostly her 1967 Dodge A100.